Nice but dull dress. 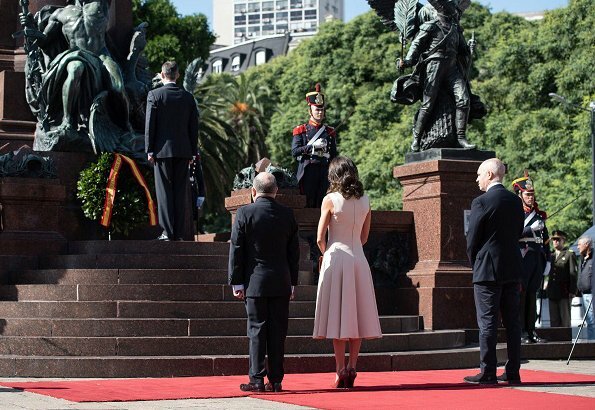 The First Lady of Argentina looks fabulous, as usual. 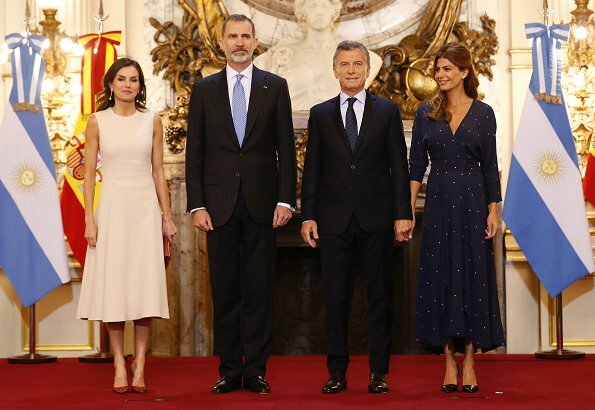 El vestido de Letizia es todo excepto aburrido. La perfección de sus cortes es extraordinaria, pero eso lo ve quien entiende de moda. FOTO 13. Very streamline and elegant dress, I am glad that she chose terracota colors for the shoes and clutch, it could have been elevated with a brooch or a modern necklace, but we all know that she is minimalist, and the earrings are fabulous,! Ms. Awada looks as good as always, with this navy dress, it has a very interesting silhouette, great hair as well, then again she hardly ever misses, BTW she is also very scarce on jewelry. Lovely dress. I think I like the lenght of this dress better the model is wearing, the skirt has a better swing to it.It seems both Ladies wear a size O-2. Both very very nice. Exquisito vestido, delicado, sobrio y muy elegante, como Letizia. El color es delicioso y los zapatos y bolso en perfecta combinación. Me alegra ver de nuevo esos magníficos pendientes. Juliana Awada ist die Modegewinnerin hier. Ein sehr schönes, schlichtes Kleid. Auch Letizia sieht gut aus, aber ich finde, zu einem Staatsbesuch ärmellose Kleider zu tragen, nicht so passend. It is very Spanish, ny wedding dress was like that but longer. 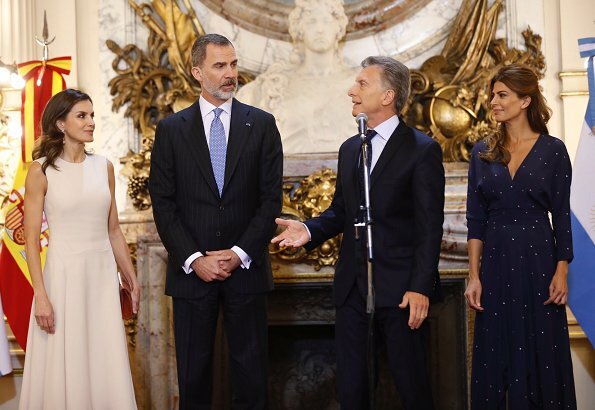 El vestido de Letizia, demasiada tela por detrás, demasiado vuelo. Otra vez cuello redondo y sin mangas. Pues yo creo q Juliana llevaba más un vestido de tarde que de mañana, demasiado largo. 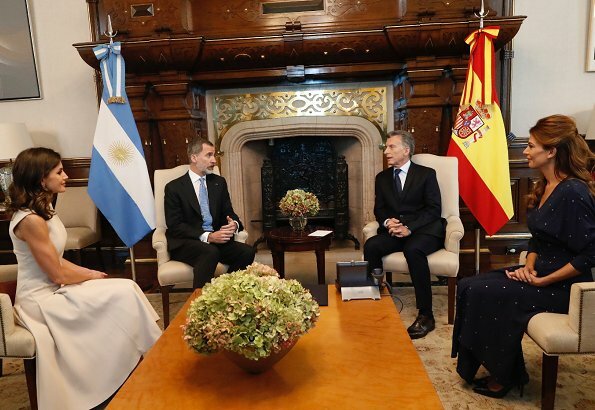 Y está demasiado delgada, Letizia ahora está estupenda. A mí Awada no me gusta nada con ese vestido, parece un palo de escoba. Con el rojo está mejor. Awada ideal ni hablar. Lleva un vestido con lentejuelas por la mañana, que no pega ni con cola. Y la parte de arriba le está floja porque va sin sujetador. Y me parece que tiene más tela que el de Letizia que, además, le pinga por todos lados. Both Letizia and Mrs Awada are very beautiful. beautifully cut, elegant dress which on Letizia is neither dull nor drab. Fabulous hair. When she is seated with the dress flowing around her, we can see the beauty of the dress. Lovely complements. Ms. Awada looks fab as always. The lady in the leather pants...working it. The seaming detail of Letizia's dress is amazing. The dress may look simple, but in person it the detail must be impressive. She has made a great choice in the color of her shoes and bag. Juliana's dress is very nice as well, though I think it a little too long. I love her hair in particular. The winning outfit for me is the lady in the leather pants. I am not sure who she is, but she nails it, down to her half tucked blouse. Nice observation. 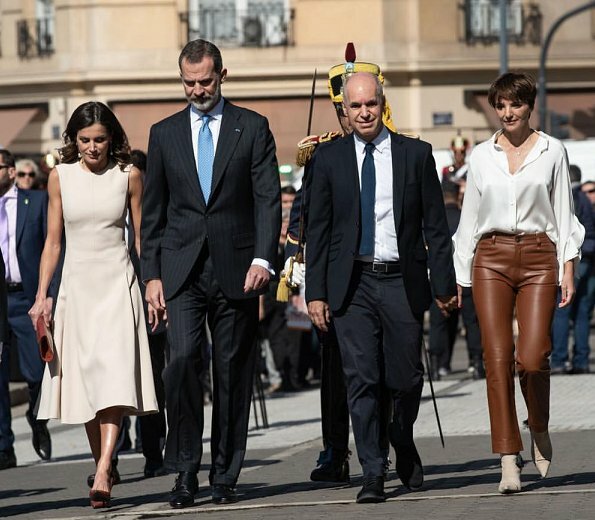 The detailing is always one of the first things you notice about Letizia's outfit choices. The color may seem blah, but the fit and style always on point. The CH for the gala looks like another hand made masterpiece. She has an eye for these things. I have read that the lady in the leather pants is the wife of the mayor of BA and a wedding planner by trade. Thank you identifying her for me. Queen Letizia and Ms. Awada are beautiful and elegant. I think Letizia is much better than Ms. Awada. Because the color of Awada's dress is navy blue,this is not suitable for Ms. Awada's skin color. The color of the dress makes Ms. Awada's skin too dark. She should choose more brighter color. I totally disagree. Navy blue is great colour for Juliana. She has a beautiful skin tone and this blue highlights it. Both ladies look fab. But I wish Letizia would also wear necklaces or brooches. Necklaces and brooches are very expensive, and they have a limit salary. There are only two who belongs to other Queens of Spain, no more. She took note. There's a bee on her red outfit today. First Lady Juliana Awada looks simply gorgeous. Love her dress, hair and warm smile. Letizia also looks very lovely in white and love her curly hair. Both ladies seem to have great raport with each other. ¿Uniforme de colegio con vuelo?? ¿A qué colegio ibas tú? Es más tipo vestido de novia. Claro que sí, guapi. Uniforme de colegio de Pedro del Hierro, blanco, lleno de cortes y sin mangas. Olé por tus delirios. 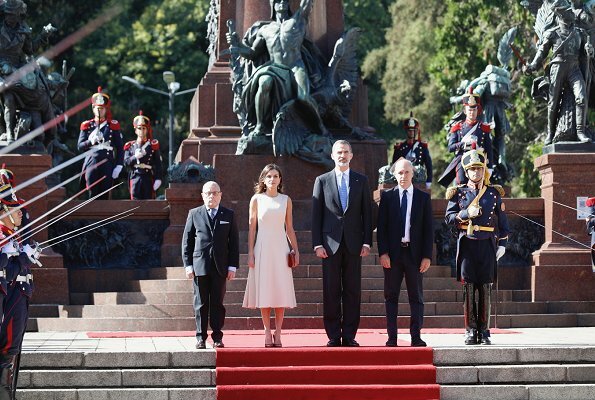 Love the cut and length of Letizia’s dress. And her accessories are spot on. Understatedly chic. She is the best dressed of all the young prominent royal women, IMO. She knows precisely what looks good on her. But why doesn’t she ever wear her wedding ring? Because in Spain the wedding ring is worn on the right hand and she has to shake thousands of hands and in the end it is awful. There is a photo after 2000 hands and it was horrid. Also in Spain is not very on trend nowadays, most proffesionals find it uncomfotable. Simple, yet oh so elegant.